Hooked on Needles: Happy Birthday to me! Fall into Fall Giveaway can be found by clicking HERE! The older I get, the less appealing things and stuff are to me. Do you find that to be true as well? 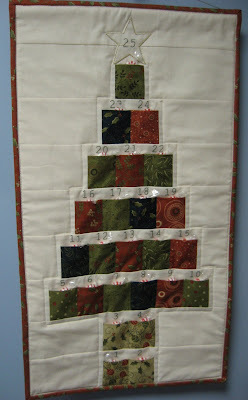 This can make gift giving occasions particularly difficult on my husband. So I had to get creative when it came time to let him know what I wanted for my birthday which was yesterday. 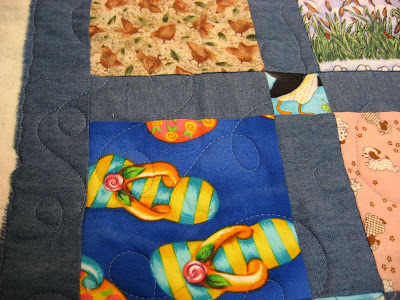 I don't need one more thing to dust or one more gadget to find a place for, but I had all these quilt tops that needed to be quilted. 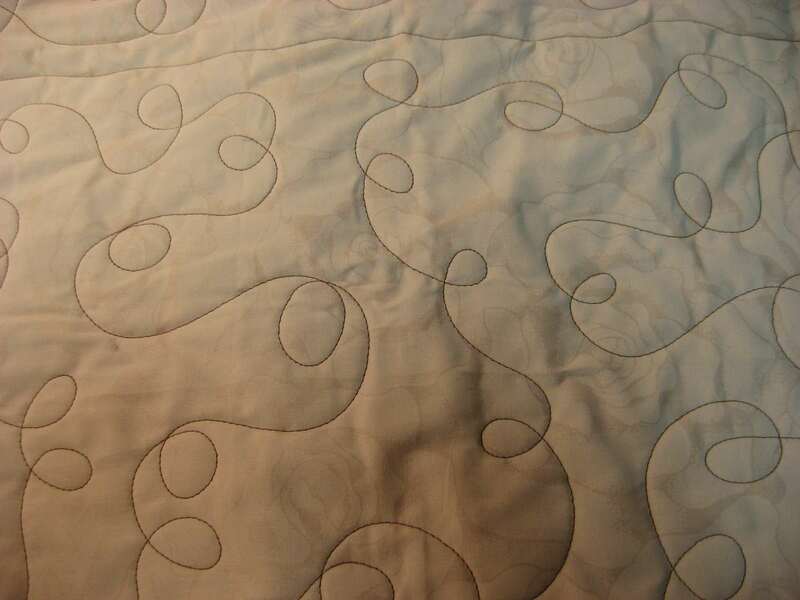 So for my birthday gift, I got to spend three hours learning how to use a long arm quilting machine so I will be able to do my own quilting instead of paying someone else to do it for me. 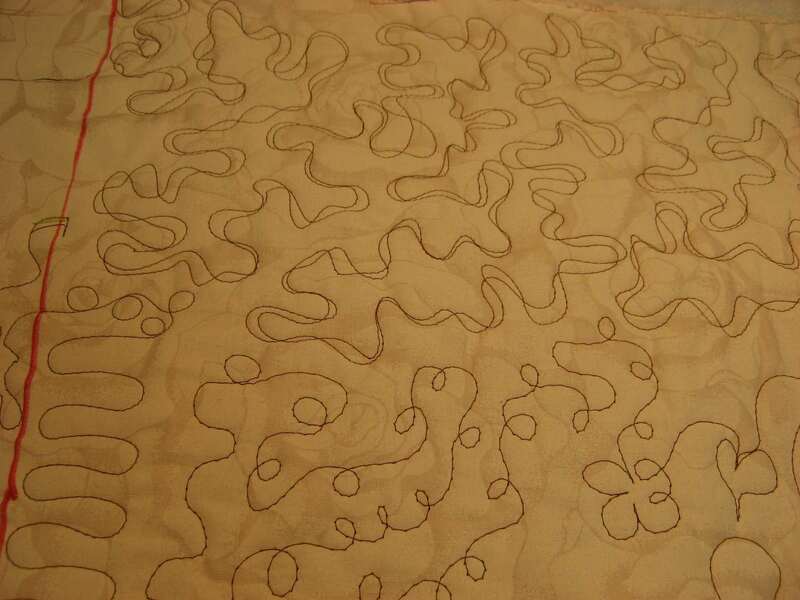 On the practice fabric already set up on the machine, I was able to get right to work doing some simple meandering, then I went back over it to create a ribbon meander. That was fun. 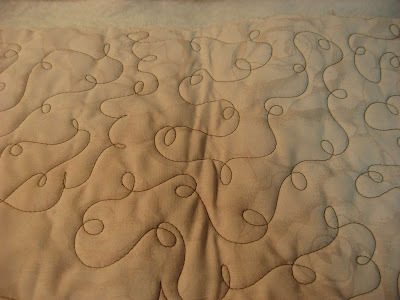 Then I moved on to some loop meanders which I like a lot more and seemed to do better at as well. 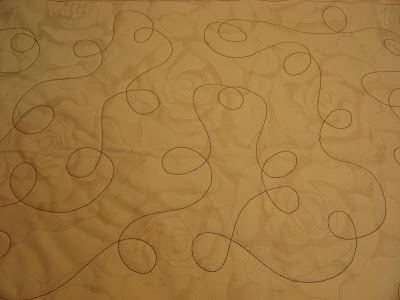 I liked the swooping and swirling movements better than just the wavy movements of the simple meander. 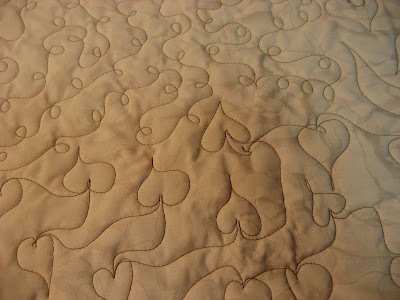 Then I tried my hand at some heart shapes which caused me to get the giggles for some reason. I didn't do too well at these as you can see and I'm sure the fact that I was laughing at how awful they were turning out didn't help much. But it was fun anyway! 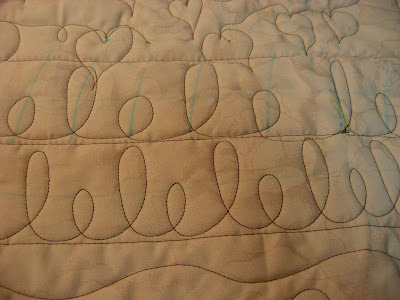 ...and surprisingly enough, I did even better with no markings to guide me. I guess freehand is more my thing. 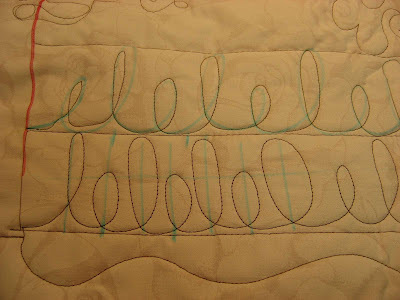 Then I went back to the loop meander and practiced making bigger loops and trying to keep my negative space even. 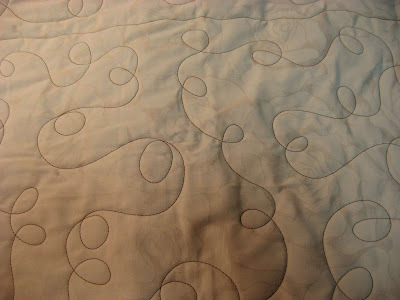 After once more pass at large-loop loop meandering across the practice fabric, I felt that I was ready to stitch on a real quilt top. Do you recognize this piece? 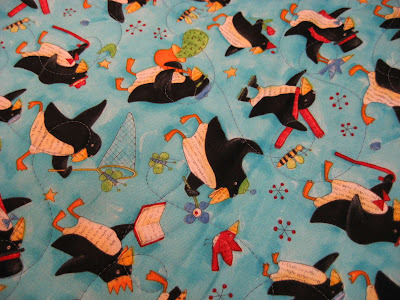 It's one of my I Spy quilt tops that I put together this summer. I brought them along so my teacher could help me decide how I might want to quilt them during another session at another time. But we moved along so quickly that she felt I was ready to go for it. 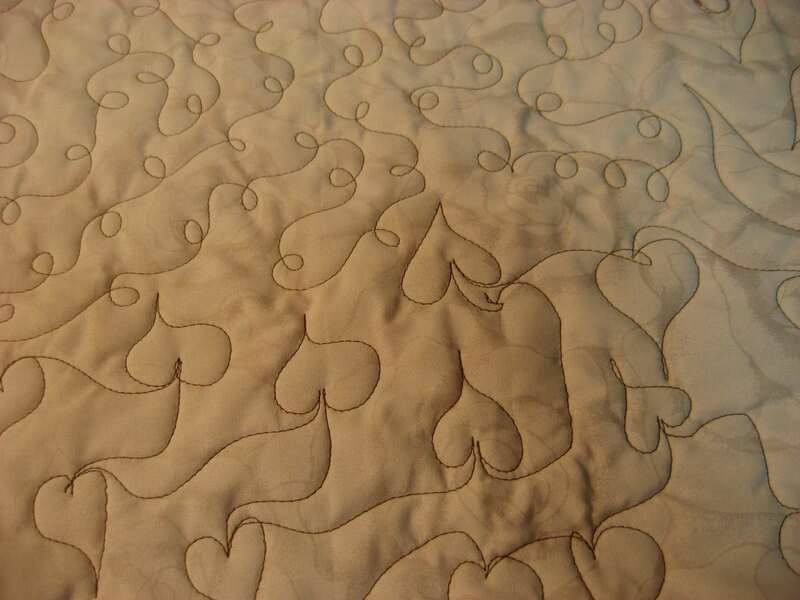 So I got a lesson on loading a quilt and was able to get right to work on it. 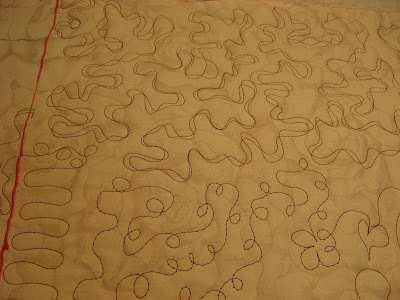 ...and there's the back with all those lovely large loop meander lines! 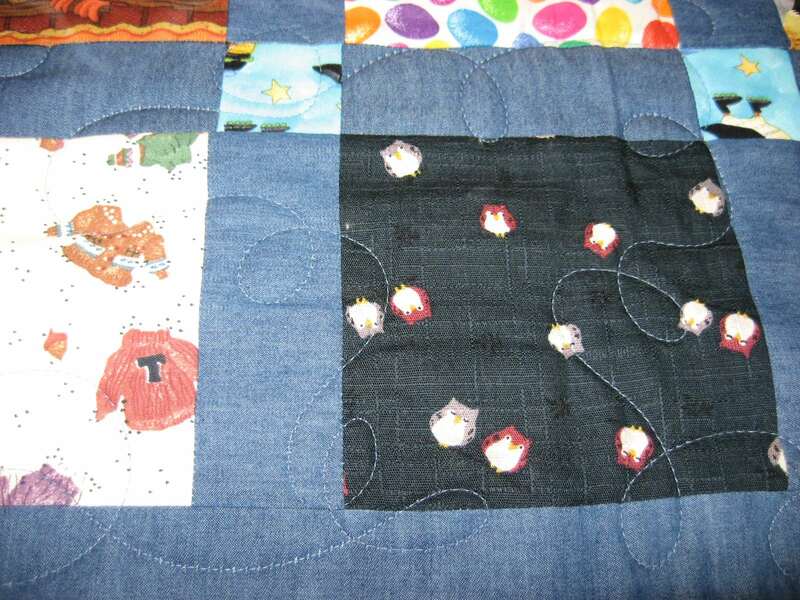 It took about a half hour to do this little quilt once it was loaded on the machine, and it was such a blast! So that was my birthday gift! Isn't that so cool? Happy birthday to me! I was so excited to get home and show my husband how much fun I had. He didn't get it, but he was glad that I enjoyed myself. Then he asked me if I wanted one of these machines! Oh my, he doesn't know what he's asking! Like I said, I don't want another thing that I have to find a place for, and something like this would definitely need its own space! 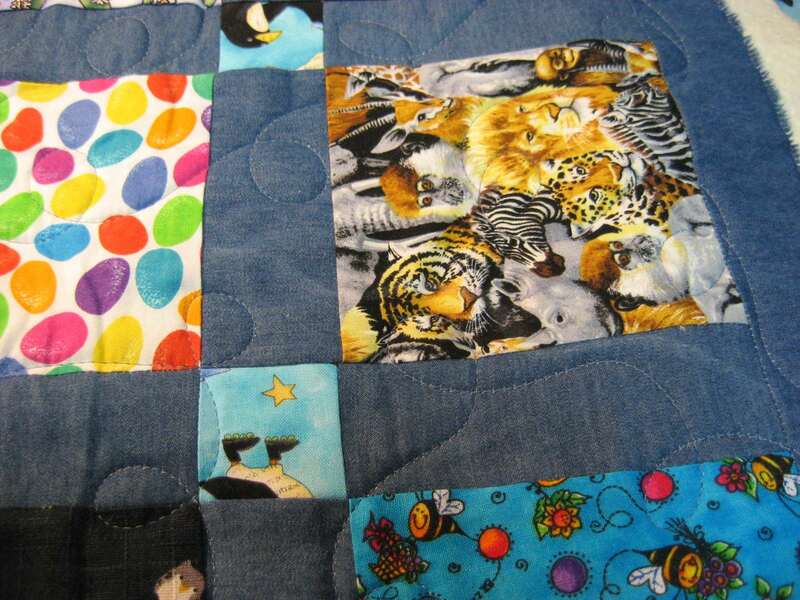 I'm perfectly content being able to schedule a few hours on someone else's machine when I have a quilt to stitch. 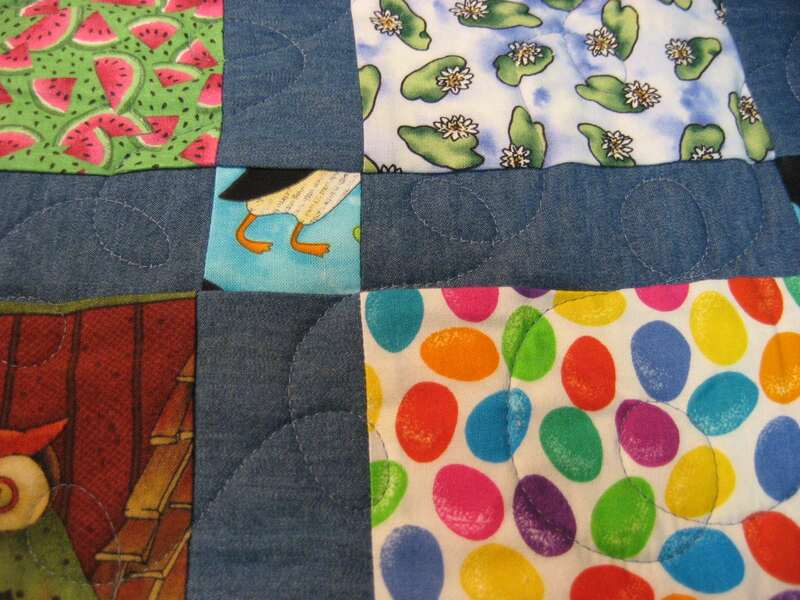 In fact, I've already scheduled my next session to quilt the other three I Spy tops! What a birthday gift! 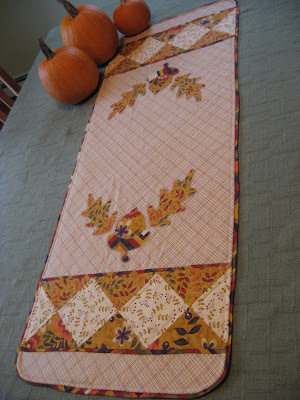 Don't forget to sign up for my Fall into Fall Giveaway for up to 5 chances to win an Awesome fall table runner made by me using my own original design! Someone's gotta win it...why not you? Happy Birthday. I think it was a marvelous way to spend your special day. Great job! Happy Birthday! So glad you enjoyed your birthday gift - certainly looked like fun to me. Happy quilting. Happy Birthday! and that sounds like a wonderful gift to yourself. I have a machine available at my work, but have yet to take advantage in learning. So much easier just to let someone else do it for me. 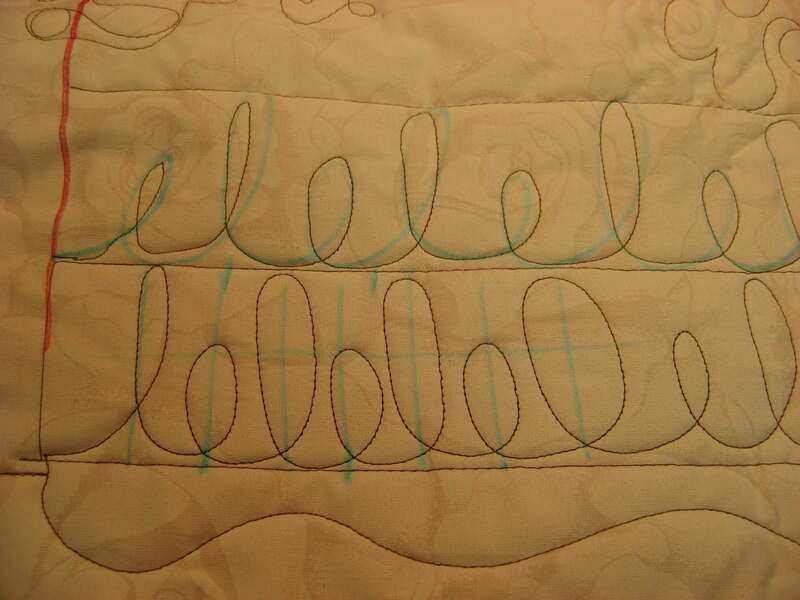 But I've set a 2011 challenge to learn more about the longarm. Happy Birthday - what a great gift your husband gave you. I am afraid I would find this machine very intimidating - guess I am always afraid of making a mistake! Did he make you a cake also??? Happy Birthday! So glad you got to do something that you have always wanted to do! You have a great husband there too! Sharonj. Mary Grace, Happy Birthday! It sounds as if you had a fun day. I didn't know you could rent a long-arm, but it sounds like a good deal. You did really well. Your husband sounds like a doll. But I agree with you, at some point all of the "stuff" is too much. What a wonderful birthday present. Your quilting looks amazing, especially for someone who's never done it before. I never could do free-motion quilting so I am in total awe at what you achieved in 3 hours. Great job! It looks like you really had a lot of fun. Happy Birthday! So sorry I'm to late to wish you a happy birthday ! I realy hope you had a lovely day !!! Oh what an awesom birthday gift...looks like you had alot of fun and have a talent for it. 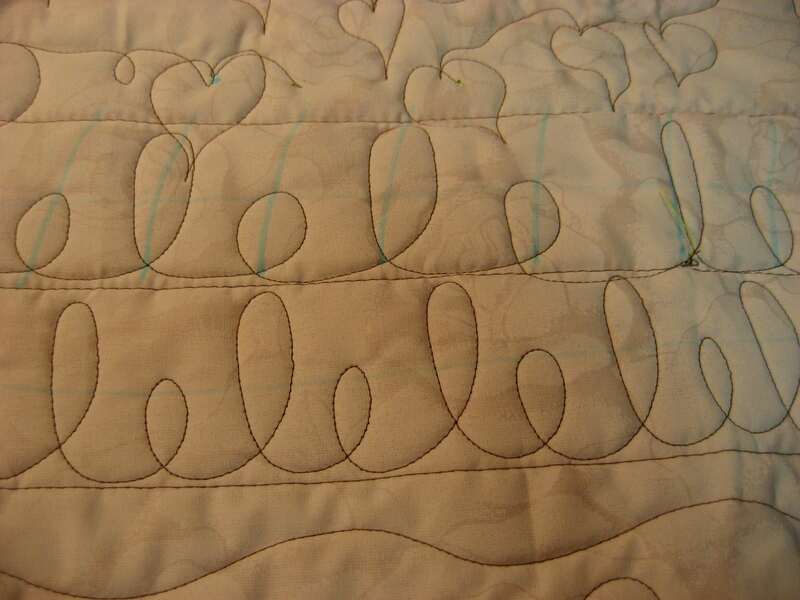 Hi I came across your site and I am so happy I did i am wanting to make the ma ingalls shawl what kind of yarn do you think would be best would red heart work? 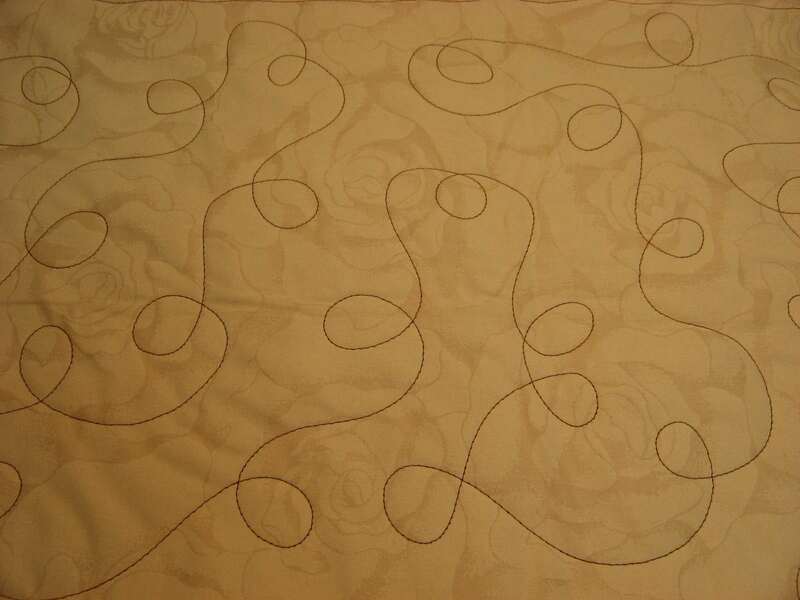 and also how long was your finsihed shawl? Happy Belated Birthday! I missed this post while I was on vacation. What a great birthday, being able to learn a new technique. I'm with you, I don't need anymore things to dust, so what did I do on vacation? I bought things to dust! I'll post them once I clean them up. Just been reading on Attic24's blog that you were born on oct 2nd. I sort of say hello and happy birthday of course, as I was born on oct 1st. I'll be scrolling down your blog presently.